WHO MAY USE THE ARTISTS’ BOOKS COLLECTION? Anyone! The books can’t be checked out but you can ask to look at them anytime. Begin at the Circulation Desk. Browse the collection 2 boxes at a time. Start with the ones labeled ‘Variety’. HOW CAN I FIND BOOKS BY A CERTAIN ARTIST, OR THAT HAVE SPECIAL BINDINGS, ILLUSTRATIONS OR FORMATS? Search the collection using the online catalog. HERE is a tutorial with tips for doing this effectively. Browse the artists’ books on the Library Flickr site. CAN I HANDLE THE BOOKS MYSELF? Yes! Wash hands before handling books or use gloves provided by Library staff. Select 2 boxes and use at a table in the main reading room. NO food or drink may be present. Use only pencil for taking notes. Return boxes to the circulation desk when finished; request additional boxes as needed. Handle the books carefully; never place an open book face down; report any damage you notice to library staff. WHY USE THE ONLINE CATALOG TO FIND ARTISTS’ BOOKS? 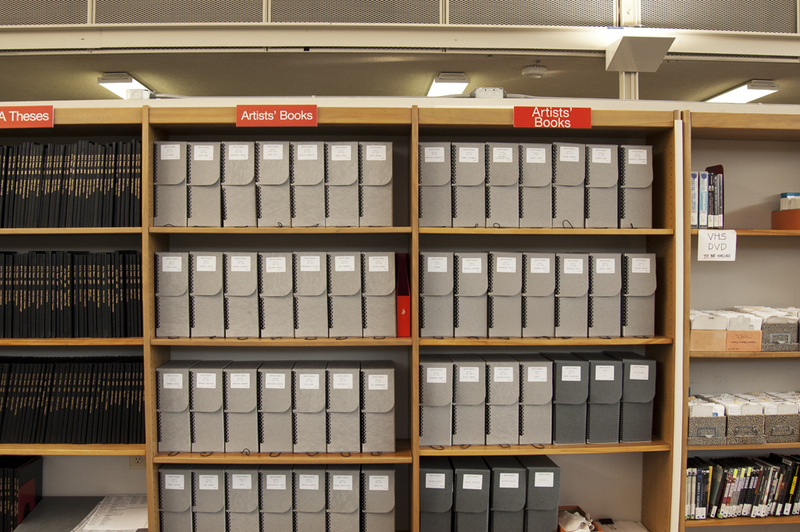 There are over 400 artists’ books in the collection. You’re welcome to randomly browse but it would take a long time to find something specific you want to see in this way. 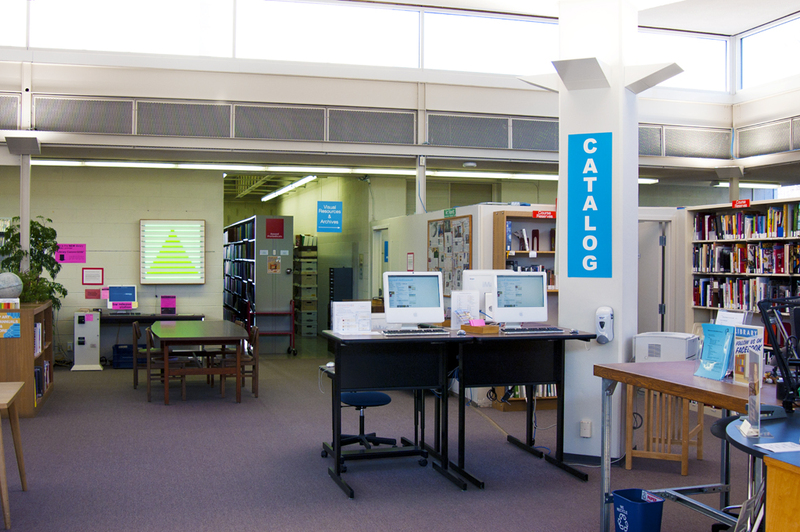 There are effective ways to use the catalog to find specific kinds of books. Focus your search for maximum results & save time in the process! This sample CATALOG TUTORIAL illustrates search results for artists’ books that have an experimental construction. HERE is a list of words for bindings, construction techniques, formats & content. Use them to get ideas & put together your own searches. Try your own words, not just those we suggest. Write down the artist’s name(s) and box numbers of the books you want to see. WHY DO THE ARTISTS’ BOOKS HAVE CALL NUMBERS IF THEY’RE NOT LIKE REGULAR BOOKS? The artists’ books are arranged by the Library of Congress classification system. Generally they’re in order by the artist’s last name. They are not grouped together by format, construction, or content. 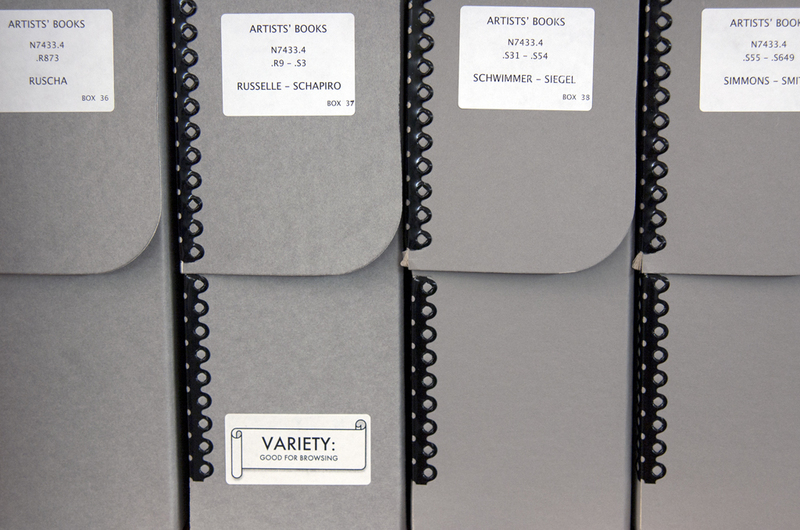 See a list of items in the Artists’ Books Collection HERE. if you can’t locate a book, or simply get stuck. The Librarians and Circulation staff are here to assist you!